1680 Alexander Humphrey obtains title to 600 acres south of Isaac Branch. The tract is called Brecknock. 1740 John Hill builds the first mill at Brecknock. 1746 John Clayton, Jr. purchases the mill at Brecknock from John Hill. 1766 Thomas Hanson obtains undivided title to the mill from his partner, Gregg. 1783 Thomas Hanson dies and leaves the mill to his daughter’s children. Her husband, Samuel Howell, serves as the caretaker of the mill. c. 1782 Through connecting power driven machinery on three floors with a complex of elevators and conveyors, Oliver Evans develops a new system of milling architecture that virtually automates the entire process. By 1812 a three-story Oliver Evans mill replaces the small mill built in the mid-eighteenth century. 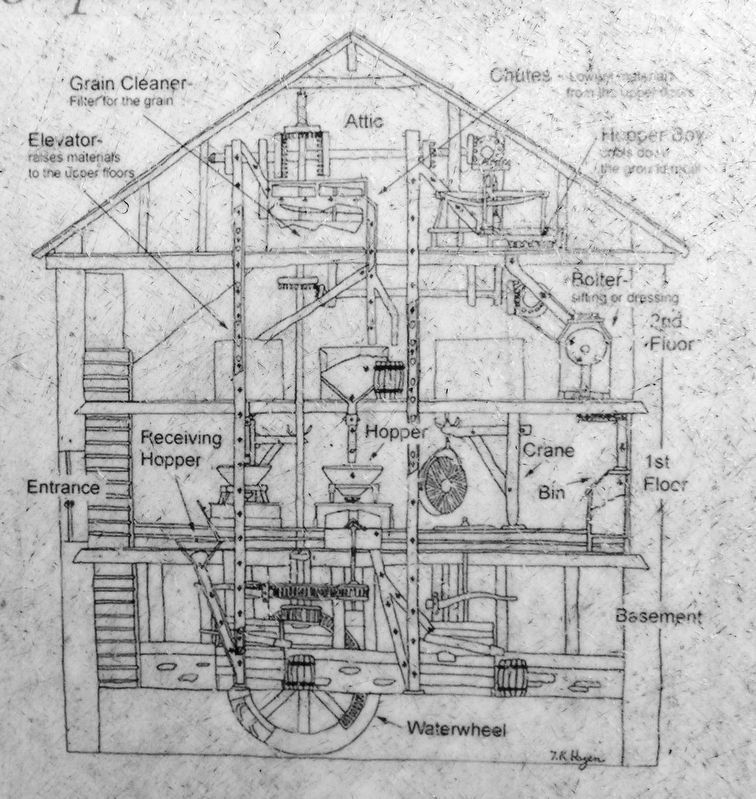 This simplified cross section reveals some of the inner workings of a mill equipped with the Oliver Evans system of machinery thought to be in use at the Howell Mill. Drawing and "The Steps in the Oliver Evans Mill Process" text adapted from Theodore R. Hazen. Theodore R. Hazen is a Master Miller, Millwright, Millstone Dresser, Mill and Milling Consultant, and Molinological Specialist. also a one-story “mill-house” fourteen feet square. In addition to the dwelling, the property also included a brick smoke house, a barn (16 by 42 feet) with a shed (18 by 14 feet), and a carriage house (22.5 by 25 feet). 1928 A significant hurricane washed out the mill dam. c. 1942 The mill building is demolished and salvaged during a World War II scrap drive. (3) Grain flowed down the chute onto the elevator, filling empty cups on their way to the attic. (4) The elevator belt dumped the cups of grain into the grain cleaner via a chute. The wire mesh grain cleaner filtered out dirt and seeds from the grain. A second apparatus, called a smutter, removed mold, fungus, and any remaining dirt. (5) The grain then moved from the grain cleaner to the second floor into bins, directly above the millstones. The grain traveled down through a control gate, from the bins on the second floor to the millstone hopper on the first floor. (7) The grain was fed into the turning upper stone, called a runner stone. A device, called a damsel, turned the runner stone against the lower stationary stone (or bed stone) at about 125 revolutions per minute. Fed through the middle of the upper stone, the ground grain made a spiral path outward between the millstones. (8) The ground grain, or meal, fell from the outside edges of the millstone down a chute to the basement. An elevator then carried the meal up to the attic to the outer edge of the hopper boy. The grain was cooled and dried by a turning rake in the hopper boy. (9) Another chute brought the cool, dried meal from the hopper boy to the bolter on the second floor. Meal was sorted from flour (smallest-sized particles), to middling (medium-sized particles), to bran (or largest-sized particles). (10) These sorted grains fell down different chutes to conveyors under the second floor, moving the grain into different produce bins on the first floor. (11) The miller packed the flour into barrels and the middlings and bran into sacks for storage or shipment. Water from the Isaac Branch provided the necessary power to run the mill. The water was collected in the mill pond. The mill pond fed water to the mill race. The mill race then fed the water to the wooden water wheel. The wooden water wheel drove the gears in the mill’s basement that powered the millstone. The power was sent up through the mill via the main shaft to power the mill’s other machinery. • Barn, Brecknock Manor House, Tenant House, and Granary. • Aerial view of Brecknock County Park showing Route 13 to the east, Rodney Village to the north, and Chapel Croft to the south. Location. 39° 7.478′ N, 75° 32.15′ W. Marker is in Camden, Delaware, in Kent County. Marker can be reached from Old Camden Road (Alternate U.S. 13) 0.2 miles north of Chapel Drive (Caboose Road), on the left when traveling north. Touch for map. 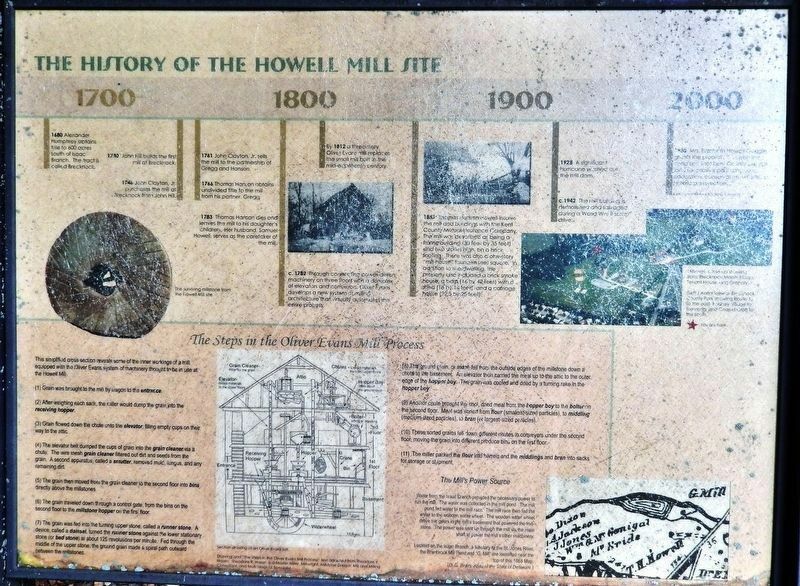 Marker is located at the Howell Mill site, on the Howell Mill trail in Brecknock County Park. Marker is at or near this postal address: 80 Old Camden Road, Camden Wyoming DE 19934, United States of America. Touch for directions. Other nearby markers. At least 8 other markers are within walking distance of this marker. East Dover Hundred (approx. ¼ mile away); Brecknock (approx. ¼ mile away); Camden (approx. 0.8 miles away); a different marker also named Camden (approx. 0.8 miles away); Morning Star Institutional Church of God in Christ, Inc. (approx. 0.8 miles away); Gov. George Truitt Home (approx. 0.9 miles away); Camden Friends Meeting (approx. 0.9 miles away); John Hunn (approx. 0.9 miles away). Touch for a list and map of all markers in Camden. More. Search the internet for The History of the Howell Mill Site. Credits. This page was last revised on April 13, 2019. This page originally submitted on April 10, 2019, by Cosmos Mariner of Cape Canaveral, Florida. This page has been viewed 29 times since then. Photos: 1, 2, 3. submitted on April 13, 2019, by Cosmos Mariner of Cape Canaveral, Florida.